Heat oven to 350°F. Place mini paper baking cups into 36 mini muffin pan cups; set aside. Combine sugar and 1/2 cup Cinnamon Sugar Butter Spread in large bowl. Beat at medium speed, scraping bowl often, until well mixed. Add 1 egg at a time, beating well after each addition. Reduce speed to low. Add flour mixture, alternately with 1/2 cup milk and 1 1/2 teaspoons vanilla. Beat well after each addition until well mixed. Spoon 1 level tablespoon batter into each prepared muffin pan cup. Bake for 14 to 16 minutes or until center is set. Cool 10 minutes in pan; remove to wire cooling rack. Cool completely. Combine all frosting ingredients except milk in large bowl. Beat at medium speed, adding enough milk for desired spreading consistency, until creamy. Frost cooled cupcakes. For regular-size cupcakes, prepare batter as directed above. Divide batter evenly among 12 regular-size muffin pan cups lined with paper baking cups. Bake for 23 to 26 minutes or until toothpick inserted in center comes out clean. 12 cupcakes. 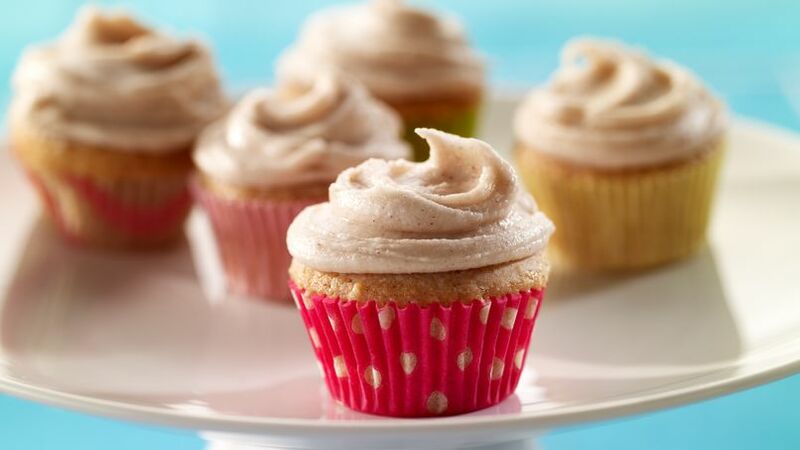 The flavor of cinnamon shines in these mini cupcakes.